The Sargasso Sea has no shores. The 2 million-sq.-mi. body of water in the middle of the Atlantic is defined by two features: the ocean currents forming the North Atlantic subtropical gyre, which cycles around the sea, and sargassum, the free-floating golden-brown seaweed. The sargassum can be found scattered throughout the sea, sometimes entwined in vast waterborne mats. 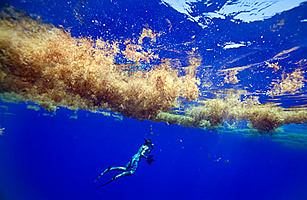 When Christopher Columbus encountered the sargassum while crossing the Atlantic, he ordered his men to fathom the depths, believing he had struck land. The oceanographer Sylvia Earle, though she prefers not to think in land-based metaphors, calls the sargassum "the golden rain forest of the sea," a base for scores of juvenile creatures, a floating nursery in a sea that was long believed to be a watery desert. She has traveled to Bermuda, on the western fringes of the Sargasso Sea, to see the sargassum and the ocean life she has worked for decades to protect. "The sargassum is the shelter," she says as her boat passes beyond Bermuda's coral reefs. "It is the island in the stream." It's an island that can be tough to find. The late-summer hurricanes that plague the Atlantic had churned the waters off Bermuda like an eggbeater, breaking up the biggest sargassum mats. But eventually, after the shallows give way to the cobalt blue of the open ocean, the signal is given: Sargassum, ho! Woven into the weed are pink filaments of coral spawn, eggs and sperm together  "a starter kit for a new coral reef," according to Earle, who slips over the side and into the ocean. The warm water is deep, but the sun can shine through the sea more than 200 ft. down, the light broken only by the golden shade of sargassum mats. Beneath the surface are thousands, perhaps millions of coral eggs, each smaller than the period at the end of this sentence, leaving Earle to swim through a sea of stars. After nearly an hour, she emerges from the water, dripping and smiling. "Every time I see a big batch of eggs, I know another generation is coming," she says. "I know there's hope." In her more than 50-year career in ocean science, Earle has studied the deep, dived it and written about it. Now she's trying to save the oceans, and she's focusing on one simple idea: protect them. Create true reserves  marine protected areas (MPAs)  on the high seas, sanctuaries for everything that swims, just as governments have created parks on land. About 12% of the planet's land surface is conserved in some way, but little more than 1% of the 139.5 million sq. mi. of the oceans have any protection whatsoever. To Earle, that discrepancy helps explain why we've treated the oceans as a "supermarket and a sewer." First through overfishing: factory trawlers and long-liners, operating with generous government subsidies, have stripped the seas of their abundance, and many scientists estimate that we've lost at least 90% of large predatory fish like sharks and swordfish as populations of once abundant commercial species like bluefin tuna have crashed. Our appetite for fish has disrupted the aquatic food chain, degrading the coral reefs that sustain ocean life around the planet. Pollution and fertilizer runoff from agriculture have helped push one-third of the more than 700 reef-building corals close to extinction; 70% of all coral reefs could be gone by midcentury. Even worse are long-term changes to the very chemistry of the seas. The oceans have gradually warmed, depriving species of nutrients and triggering deadly coral-bleaching events. Unusually high temperatures this year could wipe out coral around the planet, accelerating the destruction of the most valuable habitats in the oceans. Thanks to all the fossil fuels humans have burned, the seas have also become more acidic because dissolving CO[subscript 2] in water lowers the pH  the oceans store 50 times as much carbon as the atmosphere does  and that change will have consequences no one can predict, though none are likely to be positive. The seas seem as invulnerable as they are immense. But if we thought the oceans were too vast for human beings to affect or we were counting on the waters to purify themselves, we were wrong. "The loss we could suffer goes beyond aesthetics," says Josh Reichert, managing director of the Pew Environment Group. "It's a loss to ourselves."